This my friends is my healthier, body-loving version of a Cherryripe. I had such an amazing response from my raspberry ripe smoothie, I thought why stop there? Let’s make it into some yummy choccies, just in time for Easter! I tried to make this with limited amount of sweetener as the raspberries, sweeten it up already! Therefore it is even better for your guts! – thank me later. 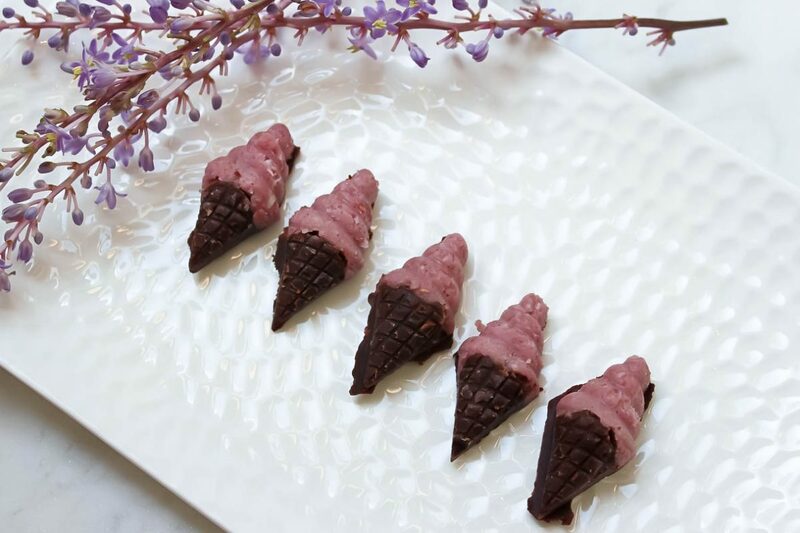 If you’re feeling adventurous like I was, why not make them into adorable ‘ice-cream’ chocolates for the kids… or yourself. I clearly made them for myself haha I used the filing as the ice-cream and the chocolate as the cone. Seriously whip these up babies up for Easter and enjoy!! Add all of the raspberry filling ingredients in a bowl or food processor and combine until the mixture is smooth and well combined. It should form a soft mixture, however not too dry or wet. They will form their shape and become harder in the fridge. If the mixture is too wet, add hazelnut or almond meal. If the mixture is to dry add more coconut oil. Roll into balls using your hands, or if you are making chocolate bars keep mixture in the bowl and allow to sit in the fridge until chocolate is ready. Place choc coating ingredients into a saucepan and allow to melt and mix together. Coat balls and place on a tray with baking paper and place back in the fridge to set. If making chocolate bars, filling neatly (about 1/2 – 1/3) and evenly into the center of the mold and layer with final layer of choc coating.